Find a cure for lymphedema? We can do it! Lymphedema and Britta have been acquainted since she was in her early teens and noticed swelling in her left foot. It wasn’t until she was in her twenties, however, working as an actress in New York City, that she realized that LE might be a lifelong companion. It was there, on a hot day in the city, that she experienced the full onset of primary lymphedema in her lower limbs. In the two decades since that time, Britta has lived a determined life. Instead of allowing LE to limit her challenges, she has resolved to challenge her limits. Living with her unwelcome companion, she has maintained a vigorous career in government and politics, skied Mount Tremblant, completed the 10k Chesapeake Bay Bridge Run, explored Alaska and climbed the Great Wall of China. Empowering others who suffer from lymphedema is Britta’s passion. 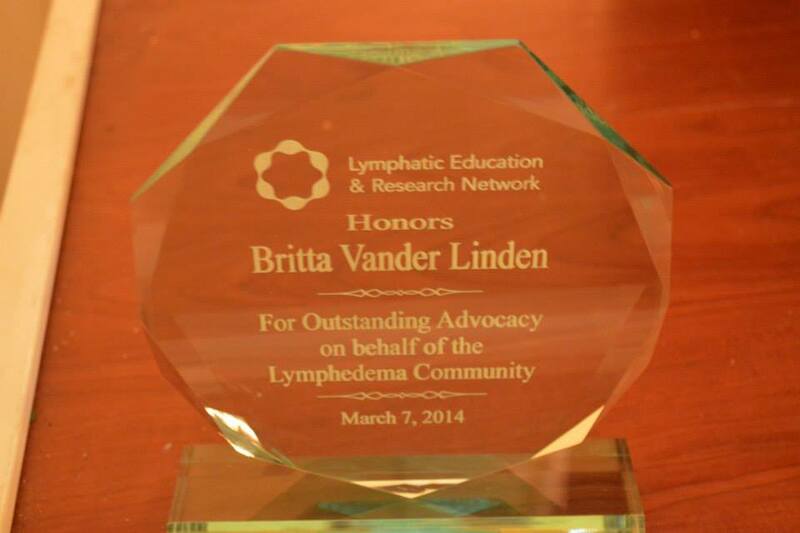 In 2014, the Lymphatic Education and Research Network, also known as LE&RN, chose Britta for its Outstanding Advocacy Award on behalf of the LE community. Obligatory disclaimer: Britta is not a medical professional or authority. The words she writes are from her own experiences and knowledge. The advise she provides does not come with a promise of results. Consult a physician or medical professional, before employing any strategies, advice or techniques depicted on this blog.